The information in this presentation is confidential and proprietary to SAP and may not be disclosed without the permission of SAP. This presentation is not subject to your license agreement or any other service or subscription agreement with SAP. SAP has no obligation to pursue any course of business outlined in this document or any related presentation, or to develop or release any functionality mentioned therein. This document, or any related presentation and SAP’s strategy and possible future developments, products and or platforms directions and functionality are all subject to change and may be changed by SAP at any time for any reason without notice. The information in this document is not a commitment, promise or legal obligation to deliver any material, code or functionality. This document is provided without a warranty of any kind, either express or implied, including but not limited to, the implied warranties of merchantability, fitness for a particular purpose, or non-infringement. This document is for informational purposes and may not be incorporated into a contract. SAP assumes no responsibility for errors or omissions in this document, except if such damages were caused by SAP´s willful misconduct or gross negligence. Self-signed certificate – CA and Server Certificates are generated using GENPSE and server certificate signing is also done using GENPSE. **Note: .cnf file should be present in the win64_x64 location which contains default values for the certificate generation like country name, state, etc. Enter the details as asked, by default it will take the values from Default.cnf file. You must follow the below rules while creating the default configuration file. You should add the values on the left-hand side exactly as mentioned below. There should be only one space between a value and the ‘equal to’ (=) sign. For example, there is only one space between CA_Common_Name and ‘equal to’ sign. You must ensure there is no space after the values on the right-hand side. Open a new document in a text editor. 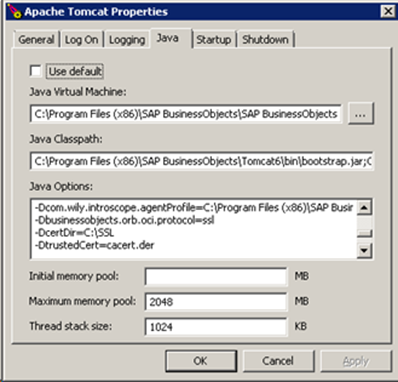 Save the file at <INSTALLDIR>SAP BusinessObjects Enterprise XI 4.0win64_x64 with default.cnf name. Make sure that Root CA certificate and PSE files are given different Common names. After the above command is run, the following five files are created. 5.1 In the CCM, stop the Server Intelligence Agent. **Note- .cnf file should be present in the win64_x64 location which contains default values for the certificate generation like country name, state, etc. Save the file as default.cnf. 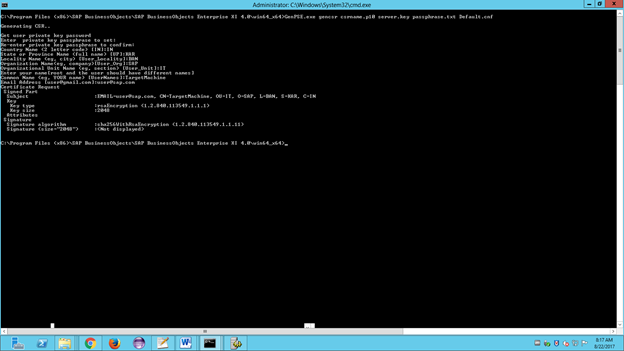 5.3 Select: Modify node (Option 3) and choose the node that you need to configure. cd <BINPATH> Source the setup/env.sh script as follows: . ../../setup/env.sh ./boe_sslconfig -dir <SSLFILEPATH> -mycert servercert.der -rootcert cacert.der -mykey server.key -passphrase passphrase.txt -psecert temp.pse -protocol ssl Exit the shell so that scripts run in the future will source the env.sh script properly. Run the below commands to generate CA using openssl and signing the csrname.p10 certificate using openssl tool. Enter PSE password as blank. 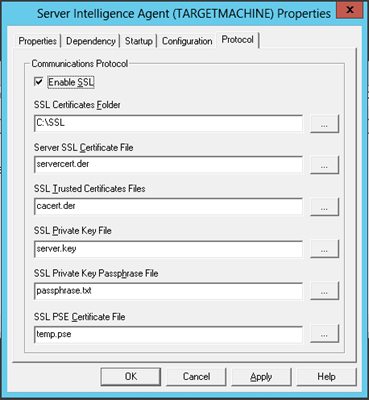 Copy the generated files to SSL folder and configure the certificates.